Yes, it's finally here, after all that waiting, the 5th (can you believe it?) annual celebration of the small story-form we all know and love. Now, I know that you, like me, might be a little worse for wear after the last couple of days, and 2016 has taken a toll on us all, but today is not a time to worry about that. It's a time for Flashing! Things kicked off earlier in the week, with a workshop in Winchester, and today we have events running all over the UK. In Oxford, Virginia Moffatt will be flash-writer in residence all day at the Albion Beatnik Bookstore. In Manchester there is a workshop being hosted by Verbose in Fallowfield. In Cardiff there will be an Art and story event at the Chapter Arts Centre. In Southampton there will be a flash workshop at the Art House. And in Bristol there will be a workshop, a walk, and an evening of readings and the launch of our anthology. And that's not all, as that webpage will tell you, on Sunday, in Dublin, you can join in Big Smoke's Flash Dash, on Monday we have an evening of readings in Manchester, again hosted by Verbose, and on Tuesday, in Belfast, you can learn to write flash with Paul McVeigh! (change the .co.uk to your local ending for your country's version of the store). And, if that wasn't enough, the Flash is currently Flooding from our online journal, and through our Facebook and Twitter feeds - a story every 10 minutes for the whole 24 hours. But wherever you are, and whatever you're doing, a big thank you from me and the team for all your support for NFFD. We never expected to be here for our 5th, and it's all thanks to you. So, Happy Day and Happy Flashing! Flash Walk – Bristol: LINE UP! Author National Flash Fiction DayPublished on 23 June 2016 30 November 2018 Leave a comment on Flash Walk – Bristol: LINE UP! Interested in our Flash Walk in Bristol this Saturday? Want to know the line-up of stories? Sure you do! It's set to be a great event! For more information, follow this link here to the Facebook Event Page: Flash Walk. Published on 23 June 2016 30 November 2018 Author National Flash Fiction DayCategories NewsLeave a comment on Flash Walk – Bristol: LINE UP! Anthology Kindle Edition, Events, and More! Author National Flash Fiction DayPublished on 19 June 2016 30 November 2018 Leave a comment on Anthology Kindle Edition, Events, and More! A Box of Stars Beneath the Bed: National Flash-Fiction Day 2016 Anthology is now available to purchase on Kindle! For more information, and to purchase the Kindle edition, check out this link here: Kindle Edition. We have a huge range of events happening for National Flash Fiction Day this year, including workshops, flash walks, and readings. For a full list of events to get involved with, check out the Events page on our main website by following this link here: National Flash Fiction Day events. Running an event not listed here? Drop us a line and let us know and we'll share it with the world! FlashFlood, our online journal which publishes a flash fiction every ten minutes or so throughout National Flash Fiction Day itself, is still open for submissions! We're looking for flash fiction of 500 words or fewer. For more information, checkout FlashFlood submission guidelines. Published on 19 June 2016 30 November 2018 Author National Flash Fiction DayCategories NewsLeave a comment on Anthology Kindle Edition, Events, and More! Author National Flash Fiction DayPublished on 17 June 2016 30 November 2018 Leave a comment on OUT NOW! A Box of Stars Beneath the Bed: National Flash Fiction Day 2016 Anthology. 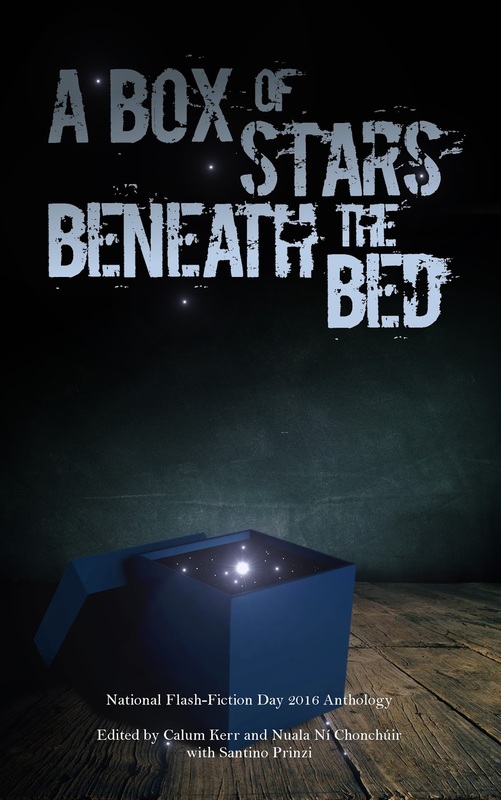 To purchase the paperback edition of the anthology, please follow this link here: A Box of Stars Beneath the Bed. The Kindle version of the anthology will be available soon. We hope you enjoy reading the anthology. It really is mighty...a book full of star quality flashes! Published on 17 June 2016 30 November 2018 Author National Flash Fiction DayCategories NewsLeave a comment on OUT NOW! A Box of Stars Beneath the Bed: National Flash Fiction Day 2016 Anthology. Well, I've spent all day with my crayons. I've done my best to stay inside the lines (I had my tongue peeking out of the corner of my mouth, and everything) and now have a finished cover for your viewing delectation. So, here it is, hope you like it. On sale for National Flash-Fiction Day on 25th June 2016. More information about all events at http://nationalflashfictionday.co.uk/. Well, the anthology is now fully assembled, and we hope it will be available for sale online before the day. We can now reveal that the title will be A Box of Stars Beneath the Bed, taken from Jon Stubbington's story. We've also managed to include a series of commissioned stories from a range of wonderful writers - some familiar names, and some up-and-coming writers. The full 'track-listing' is below, with all the wonderful stories you'll be able to read. As well as online, we'll have copies of the book at the launch event in Bristol on NFFD itself. More information about that, all the other events, can be found on the website at http://nationalflashfictionday.co.uk/events.html. We received nearly 500 stories (168,000 words, or thereabouts) and these are the 50 which made it in. So, if you were unsuccessful, please take comfort that it was a difficult decision from a large field of excellent work. The ones that we picked are the stories we felt would make the most compelling compendium, and a great snapshot of current flash-fiction. The anthology doesn't have a name yet, but we hope to announce it very soon, and it will be on sale on National Flash-Fiction Day at the event in Bristol (and possibly elsewhere) as well as online in paper and e-book formats. Sharon Telfer - Health and Pleasure, Glorious Sea! In Dublin on Sunday 26th June 2016? Come to FlashDash! Author National Flash Fiction DayPublished on 6 June 2016 Leave a comment on In Dublin on Sunday 26th June 2016? Come to FlashDash! As a part of this year's National Flash-Fiction Day celebrations, Big Smoke Writing Factory are presenting FLASHDASH on Sunday 26th June 2016! You can get involved by reading your stories at this event, enter their 105-word competition, or just come along and enjoy listening to some brilliant flash! For more details about the event, how to submit writing for the competition, and if you'd like to be considered to read at the event, please check out the Facebook event page here. Published on 6 June 2016 Author National Flash Fiction DayCategories NewsLeave a comment on In Dublin on Sunday 26th June 2016? Come to FlashDash! Author National Flash Fiction DayPublished on 4 June 2016 1 Comment on Come to Bristol for National Flash Fiction Day 2016! Only three weeks to go until it's National Flash Fiction Day! On Saturday 25th June 2016 we have lots of events going on in Bristol to celebrate! Oh, and they're all FREE! In the morning (10:30–12:00) we have a Flash Walk around Bristol city centre and harbourside, with site-specific flashes being read by trained actors along the route. We're also looking for submissions, so do send your flash fiction to us for our Flash Walk! You can find out more details about the event and submissions by checking out our Facebook event page here. In the afternoon (13:30–16:30) we have a workshop at Bristol Central Library led by award-winning writers Alison Powell and Ken Elkes. You can find details here about the workshop. And in the evening (19:00–22:00) at At the Well on Cheltenham Road, Bristol, we’ll have flash readings from local and not-so-local writers: Alison Powell, Calum Kerr, Diane Simmons, Freya Morris, Jude Higgins, Judy Darley, Ken Elkes, Kevlin Henney, Pete Sutton, Tim Stevenson, Tino Prinzi and Tom Parker. You can find more details here about the evening event. It's set to be a great day to celebrate flash fiction in Bristol this year, so do come along for the ride! Published on 4 June 2016 Author National Flash Fiction DayCategories News1 Comment on Come to Bristol for National Flash Fiction Day 2016!